Self-evaluation is a much necessary process for people both working and studying. Students also need to evaluate their skills, learning abilities, progress, success and failures, and similarly working professionals also must do the same. This is conducted from time to time by the organization which you are associated with. 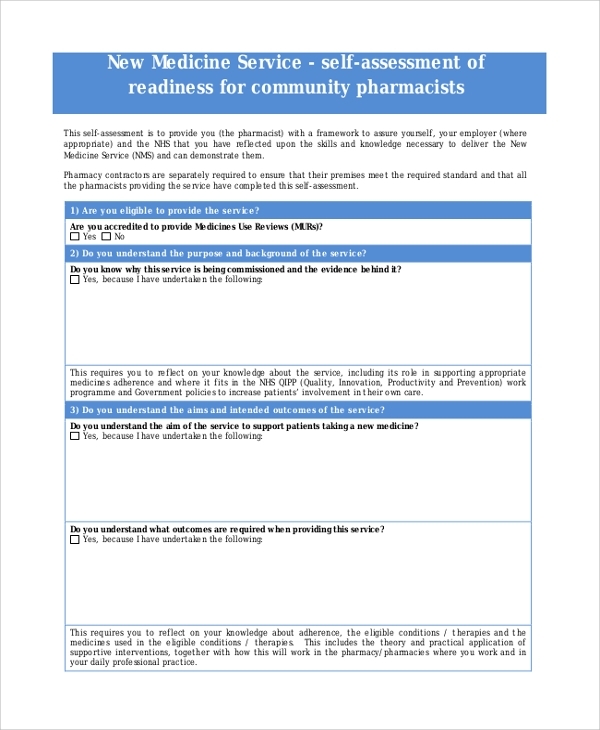 A Health Assessment Template can also be accompanied by a self-assessment form which helps them to realize how fit they are to continue with the job role. The employee self-assessment form is used to help employees evaluate themselves as they run through the form answering simple questions. The questions revolve around the past work, current work, potential, probabilities weak and strong points etc. 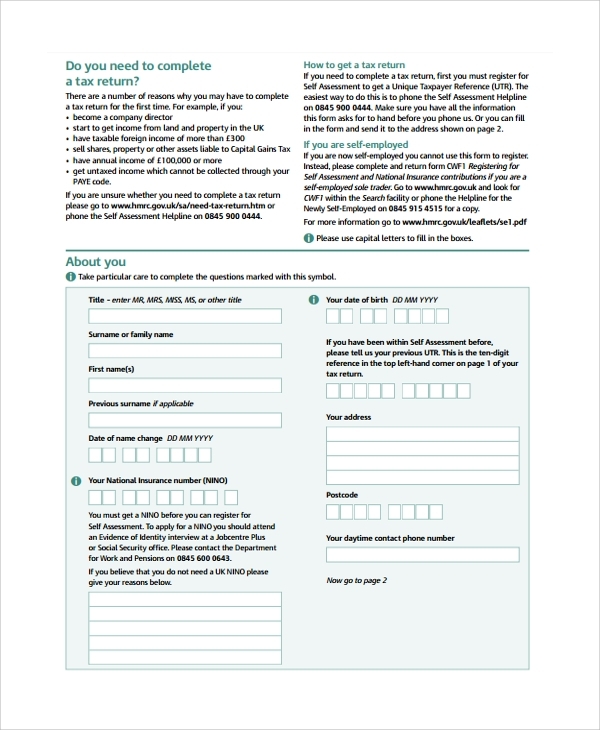 This exact form format is available ready from the template banks, and you may download one to use. The student self-assessment form is especially helpful for the students as this let them understand that how good or bad they are doing at studies, and how they are performing overall. The format is a much helpful one for both students and academic institutions who may use the ready format to start an instant evaluation of students. Teachers evaluate themselves on demand of the organization. This form of evaluation contains questions which are important and also applies to the evaluation of a teacher for any subject, course, and standard. 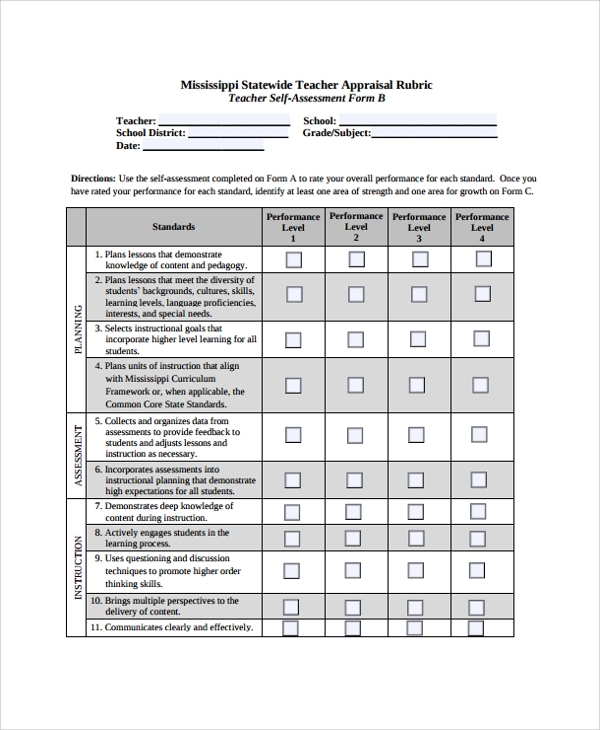 That is why the standard teacher evaluation form is of great necessity, and when you get this ready format for free download you must grab one. 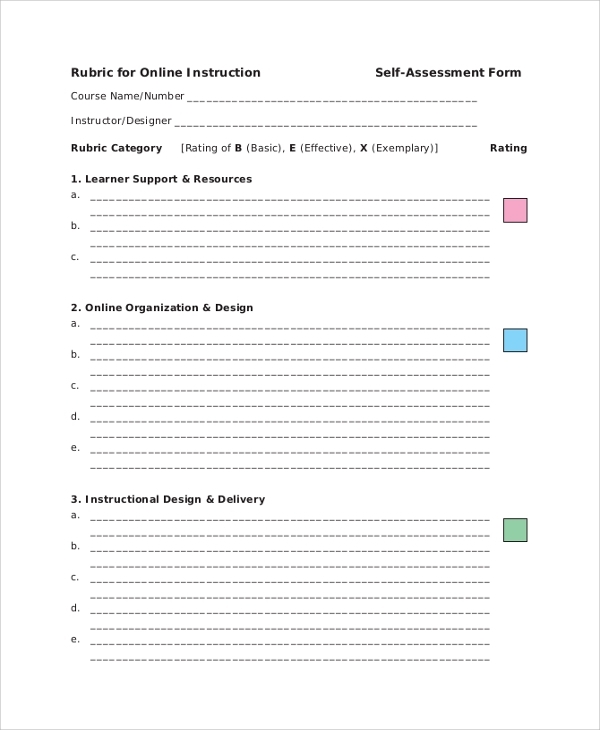 What is a Sample Self-Assessment Form? 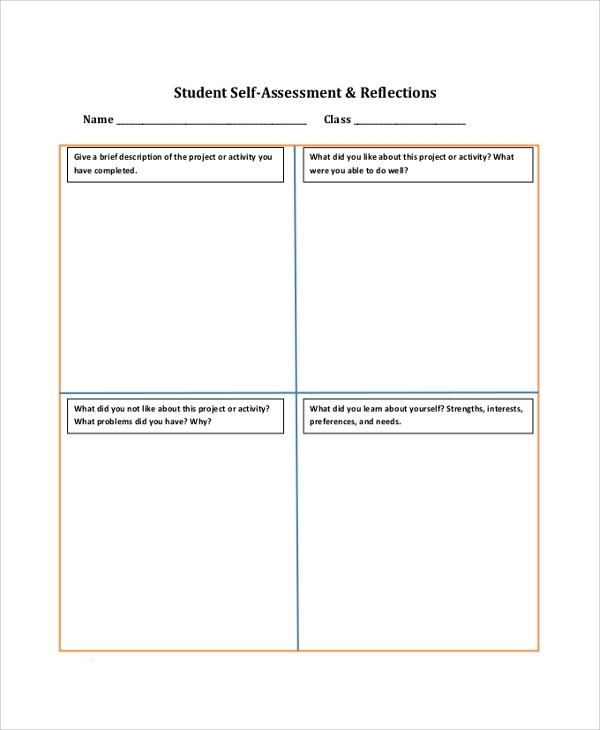 A sample self-assessment form helps in the process of self-assessment. It’s difficult to assess yourself on your own, especially when you have no idea of where to start and what to ask. But a form is unbiased, and it will bring in questions in front of you, which you must answer. Hence Self-Assessment Template gets unbiased and much effective when done with the help of the sample forms. The sample form has a question set ready, which are universally applied in cases of self-assessment in specific domains. Hence these are of special use in self-evaluation when you need to save time and get a form ready instantly. 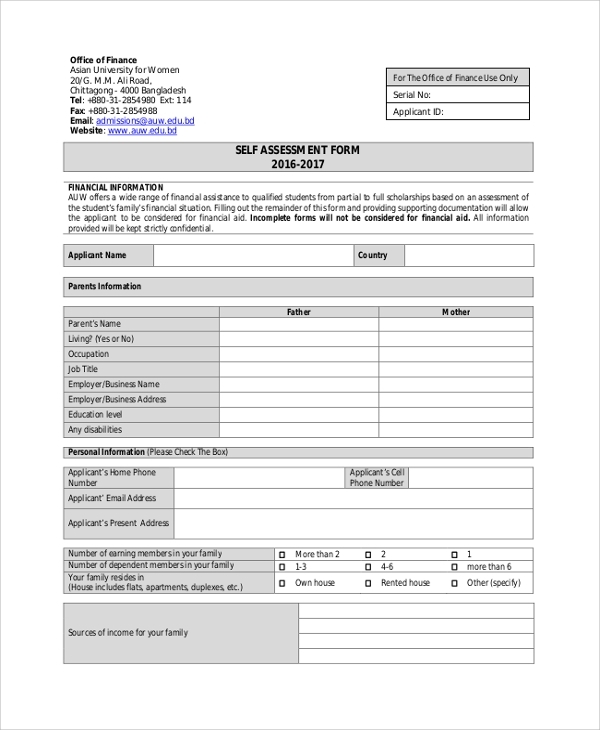 Self-assessment forms are used to bring out the reality in front of the person assessed. Often as an employee, a business person, a student or as a professional you carry on working in the same way, same mode and pace till you are asked questions. Now if you are asked questions by another person, and assessed, it may not bring out the right answers. But if you assess yourself, and ask questions then you may get the right answers. That is what the self-evaluation forms do. The samples here available for free downloads are to give you a ready format with ready questions. All you have to do is fill them up and evaluate yourself. You don’t spend time on making of a format, as you get them ready. The questions arranged in sections on the form are already proven great for evaluation and brought through experts who know how a self-evaluation process goes. 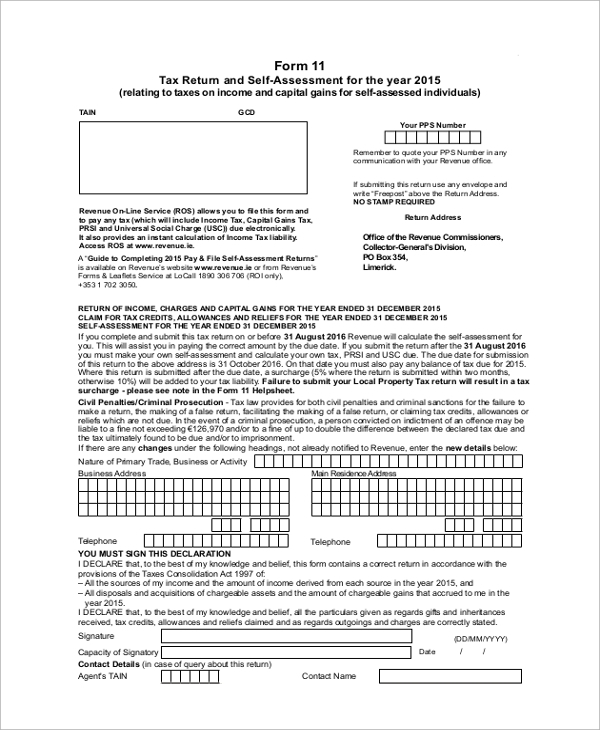 Similarly, you get self-assessment tax form, self-assessment tax samples online too, and the online self-assessment forms give a complete format. 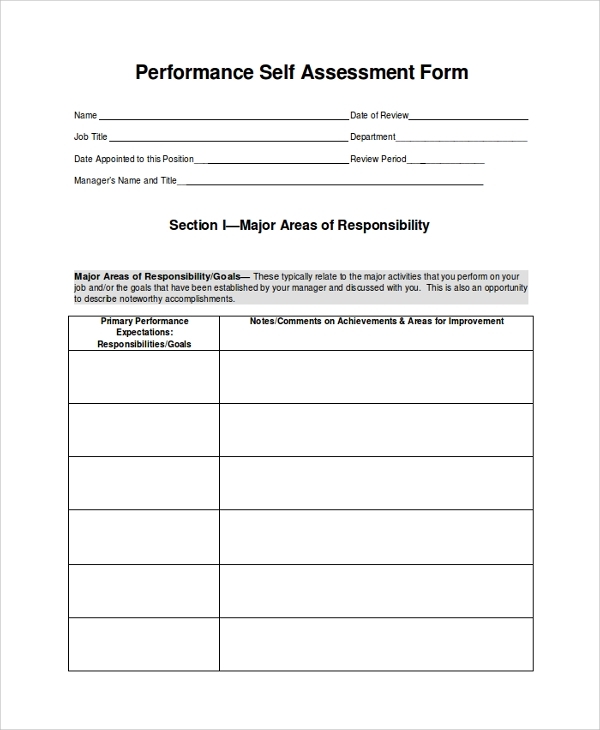 The best thing you can do to facilitate self-evaluation of employees or students in an organization is present each of them with a sheet of the form to fill up, and later give them a copy to carry home, and you keep a record. This will help you understand what they think of themselves. You may also later use a Project Assessment Template to help them evaluate their completed projects.